Lake City is the northeasternmost neighborhood of Seattle and did not come into the city limits until 1954. Map courtesy of Historylink. In the 1920s and 1930s the (future) Wedgwood area lacked a strong name association in part because it lacked a school to give the neighborhood an identity. But just to the north, on NE 100th Street at the corner of 32nd Ave NE, was a school which had a very strong history and for a long time it gave its name to the neighborhood. The name of the Maple Leaf School had a different origin from today’s Maple Leaf neighborhood which is located in north/central Seattle with the Northgate Mall as a marker of its north boundary. Today the old Maple Leaf School site at 3212 NE 100th Street is in the Meadowbrook neighborhood. 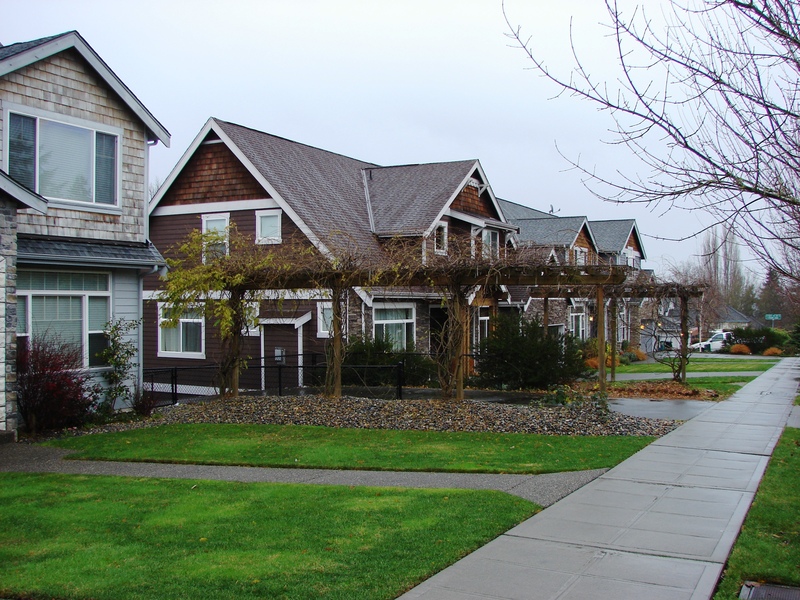 Meadowbrook is one of five contiguous neighborhoods of northeast Seattle which make up greater Lake City, including Victory Heights, Olympic Hills, Cedar Park, and the business district of Lake City. Text and photos in this article are protected under a Creative Commons Copyright. If you want to quote text or use photos please have the decency to ask permission first. Many northeast Seattle neighborhood names were invented by real estate developers: Laurelhurst, Hawthorne Hills, View Ridge, Inverness, and Wedgwood. Some northeast Seattle area names “didn’t stick” and fell out of usage, such as LaVilla. In earlier years the Wedgwood area had been called by other names, including Dutch Hollow, but later, the Wedgwood name caught on in popular usage and became predominant. The Morningside Heights Apartments at 9425 35th Ave NE. The building has storefronts at sidewalk level. Photo by Valarie. Wedgwood didn’t acquire its name until the housing development built by Albert Balch in the 1940s. In prior years the neighborhood had sometimes been called Morningside because of the 1920s Morningside Heights real estate development from NE 90th to 95th Streets on the west side of 35th Ave NE. Today the Morningside Heights Apartments on the southwest corner of 35th & 95th references this plat name. The Morningside Market at 9118 35th Ave NE is not in the Morningside Heights plat but it is close by. Its name was chosen in the 1920s while the Morningside Heights real estate promotion was going strong and people could find the market nearby. 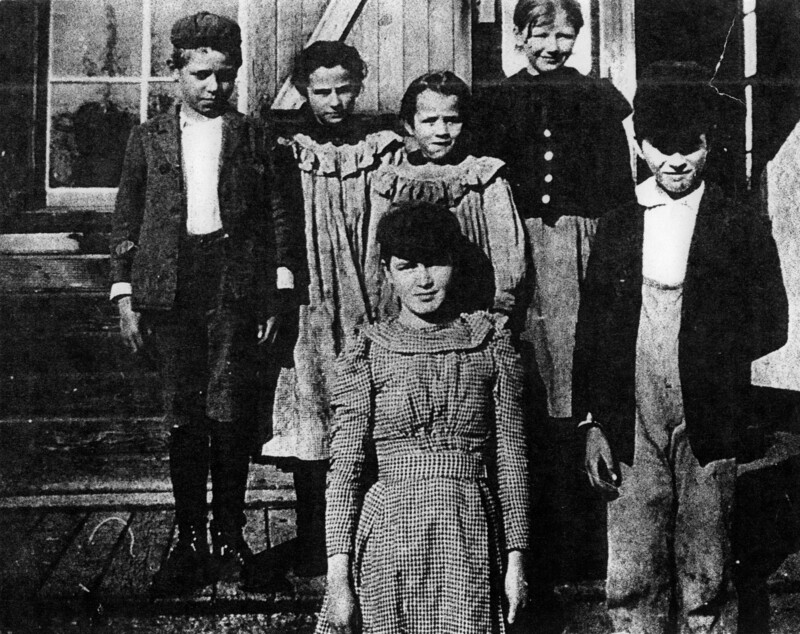 In the 1920s and 1930s the communities of northeast Seattle centered on their elementary schools, which in those days went through eighth grade. Today’s Bryant neighborhood had been somewhat nameless but it eventually became called by the name of the school on NE 60th Street which opened in 1919. The school was named for William Cullen Bryant, a poet and journalist who had nothing to do with Seattle at all, and yet the name stuck and is today the neighborhood name around the school. Bryant School took the place of the earlier Weedin and Yesler Schools, names which fell into disuse as the communities changed. In 1898 the Maple Leaf School was made up of children from two German immigrant families, the Fischers and Ohlands. Photo courtesy of Al Blindheim; do not copy without permission. The Maple Leaf School which was just north of today’s Wedgwood had origins going back into the 1890s. Over time the school was in three different locations as the attendance grew. The school’s beginning years were on Lake Washington, using the old Maple Leaf saw mill buildings at around NE 100th Street. The 1898 photo of the founding families are of German immigrants the Fischers, who had eight children, and the Ohlands with five children. The teacher was Howard A. Hanson. He later became an attorney whose contributions to state government were honored by naming Howard Hanson Dam (on the Green River at Eagle Gorge) for him. The Fischer and Ohland families lived on NE 105th Street on either side of 35th Ave NE. The Fischers were a farm and dairy family and they put a gate across 35th Ave NE at NE 105th Street to keep their cows from getting into the corn fields. In the early 1900s the children of these two families and the Hammers (American-born of German descent) began attending Yesler School at NE 47th Street near the Town of Yesler. Mrs. Hammer took all the children to Yesler in a horse-drawn wagon. Driving along 35th Ave NE, she had to stop at NE 105th Street, where one of the children would open and close the cow gate. Traveling southbound on 35th Ave NE there is a steep incline from 105th to the top of the hill at NE 95th Street. Mr. Fischer laid boards crosswise on the steepest part of 35th Ave NE, creating a “corduroy road” for traction as the horses pulled the wagon-load of children along. Around 1909 there was a crisis for the Fischers and neighbor families when their children were denied access to Yesler School, which was on NE 47th Street just east of 35th Ave NE. The Yesler School Board met and set attendance boundaries because they said that the school was growing and could not accommodate any more children. There may also have been some social-class distinctions involved, because Yesler had left behind its saw mill associations and had become Laurelhurst, organized by a real estate company. In preparation for the AYP Exposition on the nearby campus of the University of Washington in 1909, the real estate company did its best to present Laurelhurst as an upscale development with modern facilities. Having immigrant children who travelled to school in a horse-drawn wagon didn’t fit the image of the new Laurelhurst. Valarie’s daughter Amanda was thrilled to meet Margaret Nicklas who was nearly 100 years old. In 1993 I was privileged to interview two women who were nearly 100 years old, Edith who was a daughter of the Fischer family, and Margaret, the daughter of John Nicklas of Laurelhurst. Edith and Margaret had become fast friends at Yesler School and they were heartbroken when they were separated by the school board’s decision on attendance boundaries. Margaret had been present at the 1909 Yesler School Board meeting when it was announced that the school was full and could not accept students from outlying areas. In my interview with her, Margaret told me how Mr. Fischer came raging outside after the board’s decision, shouting in German and slicing the air with his buggy whip. Mr. Fischer was frantic because like most immigrants he had worked hard to give his children a new life in America, including the best education possible. He knew that he would have to find a place to establish a school closer to his home on NE 105th Street and that he and his neighbors would have to organize it themselves, as they had done with the first school at the old saw mill site on Lake Washington. 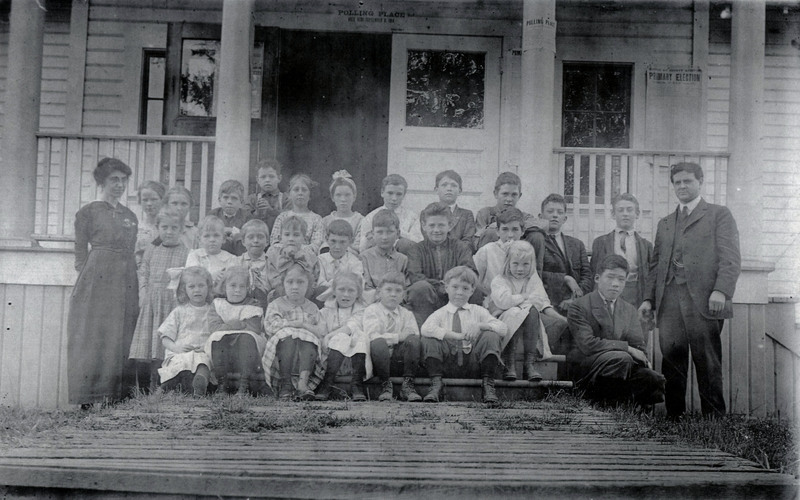 Kelly, eldest of the Nishitani children, is in the front row next to teacher Mr. Thomas in this September 1914 photo at the school on NE 105th Street. Kelly’s siblings had not yet been brought from Japan. Kelly could not speak English when he first came to Maple Leaf School in 1911. He finished in four years and at age 15 went on to Lincoln High School. Photo used by permission. In 1910 the Fischers and their neighbors built a proper school building at the southeast corner of NE 105th Street, present site of houses 3501 through 3517 NE 105th Street. The two-room wood-frame structure had no electricity but it had a potbellied wood stove where the children would set their wet shoes to dry. The Fischers and their neighbors made sure that Maple Leaf School welcomed everyone, even the immigrant Japanese family, the Nishitanis, who established the Oriental Gardens plant nursery business at NE 98th Street on today’s Lake City Way NE. The Nishitani family would grow to include ten children, from the four eldest who were born in Japan, through the rest of the children born in Seattle with the last in 1921. 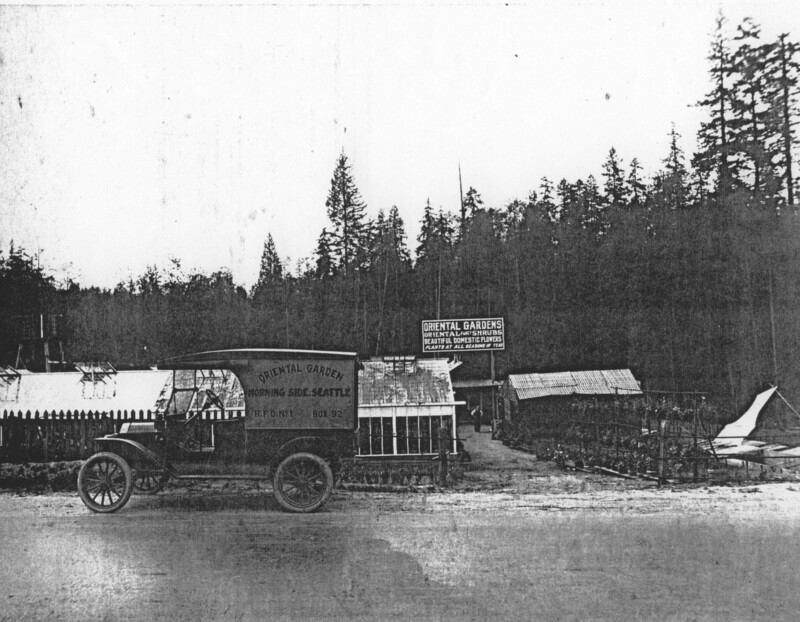 The Oriental Gardens plant nursery was at NE 98th Street on Lake City Way, present site of Dexter + Chaney. This photo was taken when the nursery faced the present Ravenna Ave NE, before Lake City Way NE was created. Photo courtesy of the Nishitani family; do not copy this photo. If there was any neighborhood discomfort about having this Japanese family in their midst, it subsided as the Nishitanis’ outstanding commitment to the community was evident. They were active in every aspect of local life, including support of the school and use of their vehicles to help others. Any lingering distrust was erased during the Spanish Flu Epidemic of 1918-19 in Seattle. Mr. Nishitani heroically delivered groceries to quarantined families in the Maple Leaf School neighborhood, showing his selflessness, concern for and connection to the community. In my interviews with Nishitani family members they would not tell me whether they ever experienced any racial bias in the neighborhood. They said only that the Maple Leaf School community was close-knit and that everyone helped one another, sharing what they had through hard times. An example of the neighborhood network was that during the 1930s years of economic hardship, Maple Leaf’s PTA mothers organized and raised support for a hot lunch program because the teachers had told them that some children were coming to school hungry. The Maple Leaf School at 3212 NE 100th Street was completed in 1926. 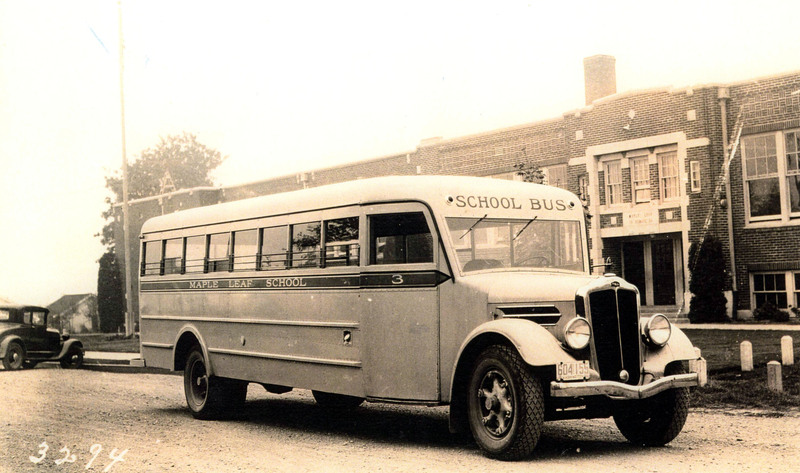 This 1930s photo shows the school bus used for the wide service area from Lake City Way to Sand Point Way. Photo used by permission. By 1926 the greater-Wedgwood area of northeast Seattle really began to grow for the first time, due in part to the arrival electric lines which made living there a lot more convenient. Children living north of NE 85th Street attended Maple Leaf School as it was the closest. The two-room, wood frame Maple Leaf School on NE 105th Street, just east of 35th Ave NE, had been expanded to three rooms but it still wasn’t enough. The school building was minimal, at best, and still didn’t have electric wiring or indoor plumbing. The site for the new Maple Leaf School at 3212 NE 100th Street was given by Mr. Fischer, with an easement allowing him to continue to water his cows at a spring on NE 100th Street near 35th Ave NE. The Nishitani family donated plants and did the landscaping around the new school building, and they made sure to plant a maple tree. LeRoy Mock (dark suit) at his office in the Shoreline School District in the 1940s. Photo courtesy of the Shoreline Historical Museum. Another family involved with the Maple Leaf School were William & Kate Mock who had moved into the neighborhood in 1910 and lived along a ravine at NE 96th Street. In 1926 their son LeRoy, who had attended school in the old wood-frame building at NE 105th, became custodian and bus driver at the new brick Maple Leaf School on NE 100th Street. 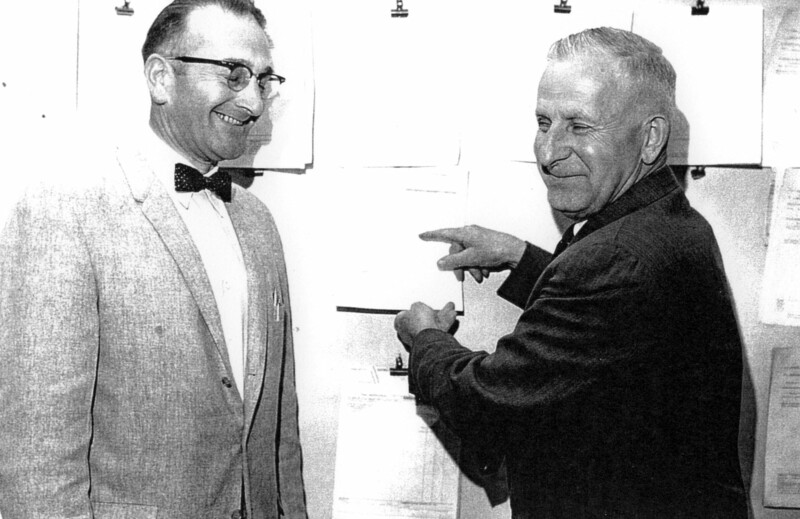 In 1944 LeRoy Mock became Superintendent of Maintenance for the Shoreline School District when it was formed that year. The new Shoreline District absorbed many small independent schools including Maple Leaf, which was still outside of the Seattle City Limits at that time. Some of the former Mock home property between NE 96th and 97th Streets is now a green space called Mock Creek Ravine. The Meadowbrook Community Center at 10517 35th Ave NE opened on January 11, 1997. In the 1920s Mr. Fischer began cutting back on his operations and although he still grew vegetables to sell at fresh markets and he kept some cows, he no longer had a dairy. In 1925 he platted some of his land as Fischer’s Highway Garden Tracts, for house lots. All of the Fischer’s valley land at the present site of Nathan Hale High School was bought and developed as the Meadowbrook Golf Course which opened in 1932. 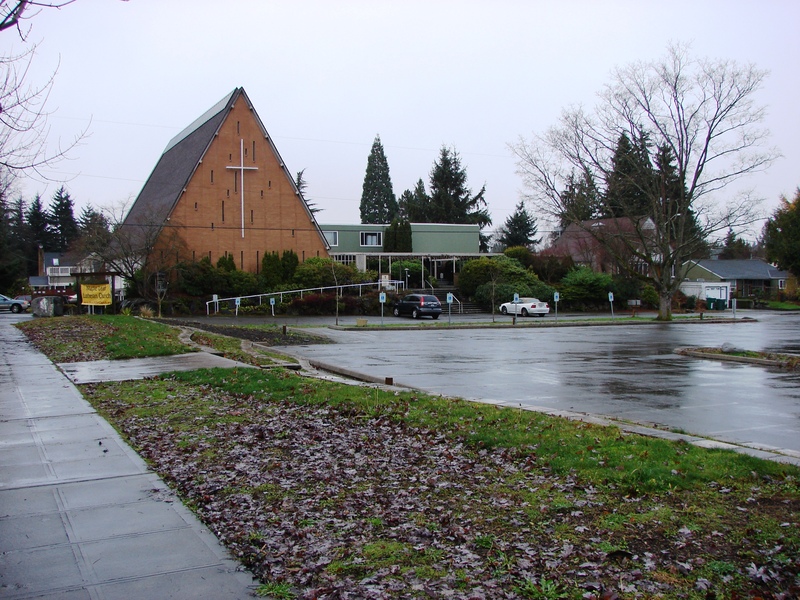 Meadowbrook is today the neighborhood name for the area from NE 95th to 125th Streets centered along 35th Ave NE, and it has the Meadowbrook Community Center at 10517 35th Ave NE. Popular use of the Meadowbrook name developed gradually over many years and it only achieved ascendancy after Maple Leaf School closed in 1979. In 1990 Seattle’s Department of Neighborhoods helped Meadowbrook neighbors form a community council with this identifying name. Wedgwood Elementary School on NE 85th Street opened in 1953 with portable classrooms, before the school building was finished. Having its own school helped give the Wedgwood neighborhood a sense of a geographic center. School attendance boundaries were set and NE 95th Street divided those who would go to Wedgwood School from those at Maple Leaf. The Wedgwood Community Club made its 1956 boundaries decision partly on the basis of school attendance boundaries, that NE 95th Street would be the northern boundary line of the definition of Wedgwood. This separated the areas so that Maple Leaf School, and what is now the Meadowbrook area, was in a different district and was no longer considered a northern part of Wedgwood. A reconstituted Wedgwood Community Council was started in 1987 and held to the same boundaries, as defined on the City of Seattle’s neighborhood map. Looking west along NE 100th Street, we see the footprint of the former Maple Leaf School which is outlined by this parking lot at the corner of NE 100th Street and 32nd Ave NE. The parking is used by Maple Leaf Lutheran Church. The historic sense of neighborhood identity revolving around its schools has been systematically attacked by Seattle Public School system in the past forty years. One of the most destructive eras in school history was the busing for racial integration of the 1970s. While everyone agrees in principle that there should be racial integration, most parents did not think that their small children should be used as tools to accomplish this. Parents did not want to put their children on a school bus and send them miles away to a school in another part of the city. Families fled from the Seattle City limits during the 1970s and moved to other areas such as Shoreline where their children could attend a neighborhood school. Seattle Public Schools enrollment fell so sharply in the 1970s that schools had to be consolidated and some buildings closed. Maple Leaf School’s long history ended sadly with the building being closed in 1979 and eventually torn down. The site was sold for development and is now occupied by homes. Looking east along NE 100th Street, we see the homes which have been built on the former playground site of Maple Leaf School. By the time Maple Leaf School closed in 1979 it had seen two and in some cases three generations of the same families, including descendants of the Fischers who still live in the area today. Local families could not understand why the Seattle School District would close a school which had always had such strong community support. Only half-jokingly, Fischer family descendants considered whether they should demand that the school district give the Maple Leaf property back to them. Their ancestor August Fischer had given the property for a school for the community, and who would have thought that Seattle Public Schools would close Maple Leaf and sell the site? Meadowbrook was very rural and never had a business district, and so the Maple Leaf School building had been the main community center, hosting everything from Boy Scouts to women’s garden club meetings. Into the 1990s a group of former PTA mothers continued to have an annual reunion because their activities and associations had meant so much to them over many decades’ time. Over the years the Seattle School District has sent children to schools far-distant from their homes, which is not only harmful to the city in creating excess traffic, but also weakens the link between a school and its geographic community. The story of the close-knit, integrated, Maple Leaf School should illustrate to us that everyone benefits from the common goal of nurturing and promoting the neighborhood school as the geographic and spiritual center of a community. 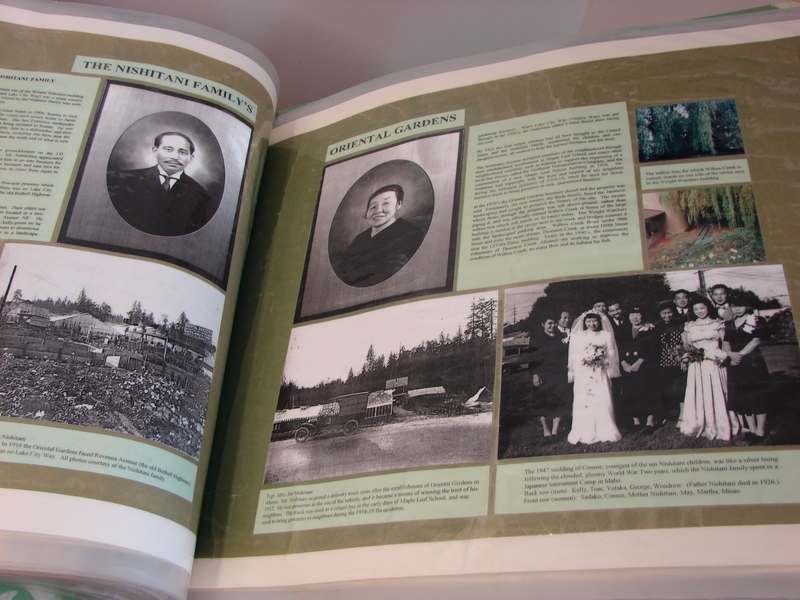 A page from Meadowbrook history: the Nishitani family had a plant nursery business on Lake City Way at NE 98th Street. Most of the stories in the history display book are now posted here on this blog. In the 1990s I was commissioned to create a history display book for the Meadowbrook Community Center which opened in January 1997. The book is on permanent display in the lobby of the building at 10517 35th Ave NE. 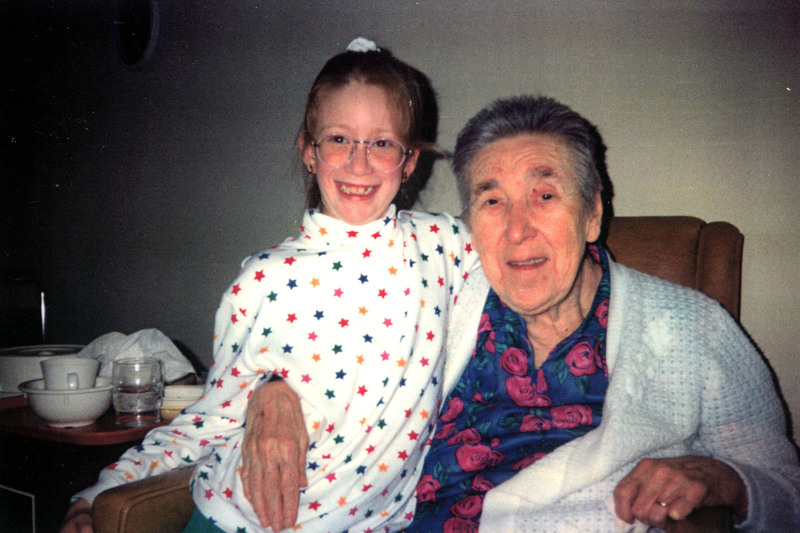 The stories of Meadowbrook for my blog page, Wedgwood in Seattle History, are based upon my interviews with community residents done in the 1990s, including Martha Nishitani, Margaret Mock Whitworth, Edith Fischer Carlsen, Margaret Nicklas Wurth, Clifford Nessel and Al Blindheim. This entry was posted in boundaries, community club (old), Immigrant heritage, Meadowbrook neighborhood, name of the neighborhood, School histories and tagged golf course, Maple Leaf School, Meadowbrook history, NE 95th Street. Bookmark the permalink.